Family Legacy is proud to share our most recent Caregiver of the Month and the special kind of person that she truly is…take a moment to read her nomination submitted by her peers at Guardian Hospice and we think you will agree! We would like to nominate Marketta Crutcher, for Caregiver of the Month. Marketta has been a part of the Guardian Hospice family since December 2016. 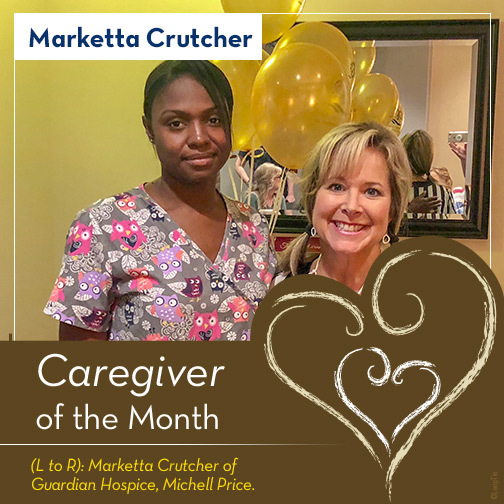 As a Hospice Aide, Marketta has always displayed an exemplary work ethic, going above and beyond to serve our patients and their families with compassion, respect and dignity. We would like to share an example of her extraordinary kindness and generosity. We had a patient who had a large family that was of little support to their dying loved one. Marketta took care of him several days a week, going above and beyond by doing his grocery shopping, laundry and even helping him write letters to his son in prison. The patient was discharged from hospice to the hospital and then went to a nursing home to receive skilled care. She continues to see him on a regular basis due to the friendship they developed, while he was under the care of Guardian Hospice. She is still available for him to call when he needs something because his family seldom visits. The patient has told her that she is more like family to him than any of his 5 children. We have been very blessed to work with Marketta and feel that she is a bright shining light to our families and patients offering them hope and comfort during a very challenging season of their life.